Since self-exiled Saudi journalist Jamal Khashoggi walked into the Saudi Arabian consulate in Istanbul this month and vanished, his case has sparked international intrigue and outrage and put leaders of his homeland on the defensive. May 2018: Khashoggi meets Hatice Cengiz, a 36-year-old Turkish Ph.D. student, at a conference in Istanbul and she soon becomes his fiancée. Sept. 28: Khashoggi visits the Saudi Consulate in Istanbul for the first time to pick up a permission document to marry Cengiz. He’s told come back later. Oct. 1: He returns to Istanbul from a trip to London. Oct. 2: He goes back to the Saudi Consulate in Istanbul. Cengiz waits for him outside for four hours, but he never comes out and is told by consulate staff that he left out a back door. Cengiz contacts the Turkish police. Oct. 7: Saudi government officials deny involvement in Khashoggi’s disappearance after reports that he was killed. Oct. 8: Sen. Lindsey Graham, R-S.C., warns the Saudis of consequences if the government is found complicit in Khashoggi’s disappearance. Oct. 9: Cengiz writes an op-ed in Washington Post, saying her husband-to-be had applied for U.S. citizenship and that his reason for visiting Turkey was to take care of all necessary paperwork for them to marry before he returned to Washington. She urges President Donald Trump and first lady Melania Trump to “help shed light on Jamal’s disappearance.” State Department spokeswoman Heather Nauert said of Khashoggi’s disappearance, “We’re not going to make any judgments about what happened to him. We don’t know what has happened to him. We don’t have any information on that. 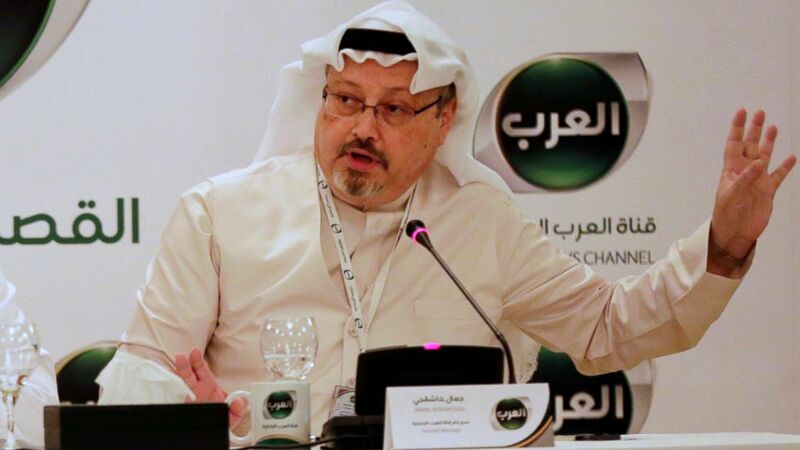 Oct. 11: The Washington Post, which Khashoggi writes for, reports the Turkish government told U.S. officials that it had audio and video recordings proving Khashoggi was killed inside the Saudi Consulate in Istanbul. Oct. 15: Trump says he spoke with Saudi King Salman bin Abdulaziz Al Saud for 20 minutes and that the king “denies any knowledge” of what happened to Khashoggi. Trump suggests Khashoggi was targeted by “rogue killers” and says he is sending Secretary of State Mike Pompeo to Saudi Arabia to speak to the king. Meanwhile, Turkish police are allowed to search the Saudi consulate in Istanbul for the first time.